Amílcar Eduardo Challú is Assistant Professor, Department of History, Bowling Green State University, 128 Williams, Bowling Green, OH 43403-0001. E-mail: achallu@bgsu.edu. This dissertation was completed in the Department of History at Harvard University under the direction of John Coatsworth. Victor Lapuente Giné is Researcher, The Quality of Government Institute, Department of Political Science, University of Gothenburg, Box 711, SE-405 30 Göteborg, Sweden. E-mail: victor.lapuente@pol.gu.se. This dissertation was completed in the Department of Political Science at University of Oxford under the supervision of José Maria Maravall and Ian McLean. 1 “Nature of the Firm,” pp. 386–405. 2 Political Economy of Public Administration, p. 95. 4 Frant, “Rules and Governance,” pp. 990–1007. 5 Moe, “Positive Theory of Public Bureaucracy,” p. 455. 6 Goetz, “Development and Current Features of the German Civil Service System,” p. 87; and Meininger, “Development and Current Features of the French Civil Service System,” p. 189. 7 Bates, Prosperity and Violence. 8 Williamson, “Modern Corporation,” p. 1547. John P. Tang is Economist, Center for Economic Studies, U.S. Census Bureau, 4600 Silver Hill Road #2K132C, Washington, DC 20233. E-mail: john.tang@census.gov. This dissertation was completed in the Department of Economics at University of California, Berkeley under the direction of Barry Eichengreen. 1 See Lockwood, Economic Development of Japan; Morikawa, Zaibatsu; and Rosovsky, Capital Formation in Japan. 2 Nakagawa, “Business Strategy.” Ohkawa and Rosovsky, Japanese Economic Growth, p. 20, date Japan's initial period of industrialization between 1888 and 1897. 4 Yagura and Ikushima, Shuyo Kigyo. 5 Statistics Bureau of Japan, Standard Industrial Classification of Japan and “Chapter 1: Land and Climate”; Ohkawa, Nihon Choki; and Trewartha, Japan. 8 For example, Schumpeter, Theory of Economic Development; and King and Levine, “Finance and Growth,” pp. 717–37. 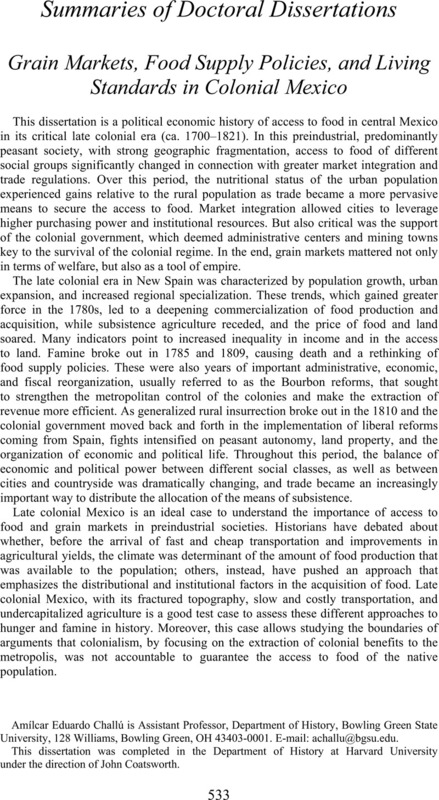 9 For example, Robinson, “Generalization of the General Theory”; and Lucas, “Mechanics of Economic Development,” pp. 3–42. 10 Rousseau, “Finance,” pp. 185–98, examines finance-led growth in Meiji Japan using national and industry aggregates. 11 Rosovsky, Capital Formation in Japan. Marco Sunder is Research Assistant, Halle Institute for Economic Research (IWH), Kleine Maerkerstr. 8, 06108 Halle, Germany. E-mail: marco.sunder@googlemail.com. This dissertation was completed in 2007 at the University of Munich under the direction of John Komlos and Claude Hillinger. 1 Komlos “Shrinking in a Growing Economy,” pp. 779–802. 2 “Height and Weight of West Point Cadets,” pp. 897–927. 3 Johansson, “Fogel and the History of Mortality,” p. 249. 4 Steckel, “Health and Mortality of Women and Children,” pp. 333–45. 5 Haines, Craig, and Weiss, “Short and the Dead,” pp. 382–413; and Cuff, Hidden Cost of Economic Development. 6 Woitek, “Height Cycles,” pp. 243–57. 7 Komlos “Shrinking in a Growing Economy,” pp. 779–802; and Cuff, Hidden Cost of Economic Development. John Parman is Postdoctoral Teaching Fellow, Department of Economics, University of California, Davis, One Shields Avenue, Davis, CA 95616. E-mail: jmparman@ucdavis.edu. This dissertation was completed in 2008 in the Department of Economics at Northwestern University under the supervision of Joseph Ferrie (chair), Joel Mokyr, and Christopher Taber. Financial support was provided by the Economic History Association. 1 For a thorough discussion of the evolution of the public school system, the rise in attendance rates and educational attainment and the returns to education see Goldin and Katz, Race Between Education. 2 For details on Iowa's schools at the beginning of the twentieth century, see Goldin and Katz, “Education and Income,” pp. 782–818. 3 The specific sources used are the annual reports of the county superintendents of schools. These records offer information on pupils, teachers, expenditures, revenues, school buildings and curriculum at the district level. 4 The 1915 Iowa State Census is the only American census, state or federal, containing both income and educational attainment data prior to 1940. 5 For intergenerational elasticity estimates using modern data, see Hertz, “Trends in Intergenerational Elasticity,” pp. 22–50; and Solon, “Cross-Country Differences,” pp. 59–66. 6 All comparisons to modern intergenerational income mobility rates are done by comparing the Iowa estimates to equivalent estimates using the Panel Study of Income Dynamics. 7 These findings are consistent with Ferrie's “History Lessons,” pp. 199–215, study of occupational mobility rates over the past century. Ferrie finds that intergenerational occupational mobility was substantially higher at the turn of the century than in recent decades. 8 See Hertz, “Trends in Intergenerational Elasticity,” pp. 22–50, for a study of intergenerational income mobility trends in the United States over recent decades. 9 A variety of measures are used. The school quality measures constructed include spending per student, student-teacher ratios and taxes per student. School access is measured by the number of classrooms per square mile in a school district, the number of graded classrooms per square mile in a district and a dummy variable indicating whether or not a district had graded schools. 10 For a discussion of Iowa agriculture at the turn of the century, see Iowa State University, Century of Farming. The work of Olmstead and Rhode, “Red Queen,” pp. 929–66 and Induced Innovation,” pp. 100–18, discusses agricultural innovation in this period for the nation as a whole. 11 These types of spillovers have been observed in field studies in developing nations. See for example the work of Conley & Udry, “Social Learning,” pp. 668–73; and Foster and Rosenzweig, “Learning by Doing,” pp. 1176–1209. 12 A farmer's annual earnings increased by 5 to 6 percent with an increase in his own high school attainment of one year and increased by 2 to 3 percent with an increase in the high school attainment of his neighbor of one year. Evan Roberts is Lecturer, Department of History, School of History, Philosophy, Politics & International Relations, Victoria University of Wellington, PO Box 600, Wellington, New Zealand. E-mail: evan.roberts@vuw.ac.nz. This dissertation was completed in 2007 in the Department of History at the University of Minnesota under the supervision of Steven Ruggles (advisor), Dennis A. Ahlburg, Sara M. Evans, Paul Glewwe, and David Good. The dissertation was greatly aided by funding from the Economic History Association and the Alfred D. Chandler Traveling Fellowship from Harvard Business School. 1 Goldin, Understanding the Gender Gap; Kessler-Harris, Out to Work. 2 Kessler-Harris, Out to Work. 3 North Atlantic Population Project, NAPP: Complete Count Microdata. Version NAPP 1.0; Ruggles et al., Integrated Public Use Microdata Series: Version 3.0. 4 Scharf, To Work and to Wed.
6 Kessler-Harris, In Pursuit of Equity. 1 Goldin and Katz, “Education and Income,” pp. 782–818. 2 Fetner, Immersed in Great Affairs, p. 46.